Port of entry may also refer to a weigh station located near a state border. A port of entry at Shir Khan Bandar in northern Afghanistan near the Tajikistan border. In general, a port of entry (POE) is a place where one may lawfully enter a country. It typically has border security staff and facilities to check passports and visas, and inspect luggage to assure that contraband is not imported. International airports are usually ports of entry, as are road and rail crossings on a land border. Seaports can be used as ports of entry only if a dedicated customs presence is posted there. The choice of whether to become a port of entry is up to the civil authority controlling the port. On the other hand, however, some "former" airports of entry chose to leave their name with the word "international" in it, even though they no longer serve international flights. One example is Osaka International Airport. Even when it had ended all international services and became a purely domestic airport after the opening of Kansai International Airport in 1994, it kept its original name of "Osaka International Airport". Many airports in the nearby region have the same situation, like Taipei Songshan Airport. Songshan retained its official Chinese name, Taipei International Airport, after Chiang Kai-shek International Airport (now Taiwan Taoyuan International Airport) opened. Similar cases of transitions of international airports such as Seoul, Tokyo, Nagoya, Shanghai, Hong Kong, Bangkok, Tehran, etc. For the European Union, flights between countries in the Schengen Area are considered domestic regarding passport and immigration check. Several international airports have only intra Schengen-flights. Several of these have occasional charter flights to foreign countries. Some cases of statelessness have occurred in airports of entry, forcing people to stay there for an extended period. A famous case was of Mehran Karimi Nasseri, an expelled Iranian who lived in the Charles de Gaulle Airport in France for approximately eighteen years after being denied entry to the country. There are two films about his story, Tombés du ciel and The Terminal. Another case is Zahra Kamalfar who lived in the Sheremetyevo International Airport for many months before getting refugee status in Canada. Every port of entry must have a Port Director, which is a higher pay grade than a typical border inspector. The U.S. government has determined that some small border crossings do not need their own Port Directors. As a result, border stations like Churubusco, Chateaugay and Fort Covington, New York are considered "stations" within the Trout River Port of Entry. Historically, many roads entering the U.S. had no border inspection station. 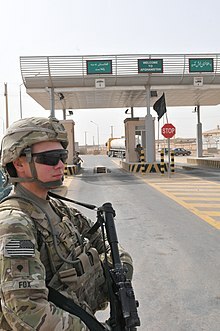 Before September 11, 2001, it was permissible for persons entering the U.S. to do so at any point (including back roads or closed border stations), as long as they proceeded directly to an open border inspection station. In fact, the U.S. Customs Service and U.S. Immigration and Naturalization Service routinely rented property in houses, post offices, and storefronts far from the physical border, and people entering the U.S. were expected to travel to these locations without stopping so they could make their declarations. This policy has since changed, and most of the roads entering the U.S. at locations other than an open and staffed border inspection station have since been barricaded. In some countries, immigration procedures are carried out by the armed forces rather than specific immigration officers. However, in most, the levying of duty on imports is still carried out by customs officers. Immigration clearance in some ports of entry have automated sections open to the country's own residents or citizens, such as the E-Channel found in Hong Kong and Macau, and Global Entry found at some airports in the United States. On some international borders, the concept of a port of entry does not exist. Travelers may cross the border wherever and whenever convenient, for example within the Schengen Area. In some cases this may be restricted to citizens of specific countries and to travelers who are not carrying goods over the customs limits; others may only cross the border at a designated border crossing during its opening times. ^ "Emotional reunion for Iranian family at Vancouver airport". CBC News. 2007-03-15. Retrieved 2012-05-12. This page was last edited on 20 March 2019, at 05:57 (UTC).